Matt at Scrubbles found Pepsi Throwback and Mountain Dew Throwback at his local store. Matt also links to a Bev Review review that notes "Ironically, the use of the "real sugar" line may also prompt potential customers to ask, "so, if this is real sugar, what was the stuff in Pepsi before?" I'm sure the folks over at the Corn Refiners Association would love to answer that question." We tried the Mountain Dew throwback and also found the Dr. Pepper throwback this weekend. We really liked both of them. They had a crisper mouthfeel and were not as sweet as the sodas are today. I was suprised that I liked the Mountain Dew since I normally really don't! Haven't tried these yet..but I found a coke one and it was tasty. 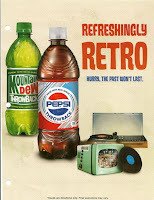 I like Pepsi better so I'm eager to try the old style!